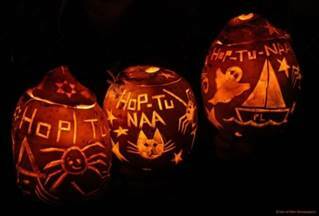 As you probably know, Halloween or Hallowe'en, also known as Allhalloween, All Hallows' Eve, or All Saints' Eve, initiates the triduum of Allhallowtide, the time in the liturgical year dedicated to remembering the dead, including saints (hallows), martyrs, and all the faithful departed believers. According to many scholars, All Hallows' Eve is a Christianized feast initially influenced by Celtic harvest festivals, with possible pagan roots, particularly the Gaelic Samhain. Other scholars maintain that it originated independently of Samhain and has solely Christian roots. Today's Halloween customs are thought to have been influenced by folk customs and beliefs from the Celtic-speaking countries. Hop-tu-Naa is a Celtic festival celebrated in the Isle of Man on 31 October. Predating Halloween, it is the celebration of the original New Year's Eve (Oie Houney). The etymology of 'Hop-tu-naa' is uncertain, some sources speculating that it comes from Manx Gaelic Shogh ta'n Oie, meaning "this is the night", though there are a number of origins suggested for the similar Hogmanay, which is the Scottish New Year. For modern Hop-tu-Naa, children dress up and go from house to house with the hope of being given sweets or money, as elsewhere. 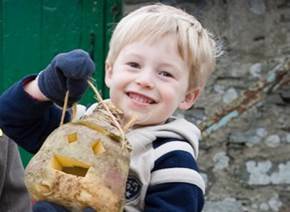 However, the children carry carved "turnip" lanterns (actually swedes, which are known as turnips or moots by the Manx) rather than pumpkins and sing Hop-tu-Naa songs (see below). In older times, children would have also brought the stumps of turnips with them and batter the doors of those who refused to give them any money, in an ancient form of trick or treat. Some of the older customs are similar to those now attached to the January new year. It was a time for prophesying, weather prediction and fortune-telling. Last thing at night, the ashes of a fire were smoothed out on the hearth to receive the imprint of a foot. If, next morning, the track pointed towards the door, someone in the house would die, but if the footprint pointed inward, it indicated a birth. A cake was made which was called Soddag Valloo or Dumb Cake, because it was made and eaten in silence. Young women and girls all had a hand in baking it on the red embers of the hearth, first helping to mix the ingredients, flour, eggs, eggshells, soot and salt, and kneading the dough. The cake was divided up and eaten in silence and, still without speaking, all who had eaten it went to bed, walking backwards, expecting and hoping to see their future husband in a dream or vision. The future husband was expected to appear in the dream and offer a drink of water. Another means of divination was to steal a salt herring from a neighbor, roast it over the fire, eat it in silence and retire to bed. The moon shines bright; Trol-la-laa. Supper of the heifer; Trol-la-laa. 'Cre'n gauin marr mayd ? Hop-tu-naa. The little speckled heifer. Trol-la-laa. We'll put in the pot for you. Trol-la-laa. Yn kerroo veg cooyl, Hop-tu-naa. Give to us, give to us. Trol-la-laa. Hayst mee yn anvroie, Hop-tu-naa. I scalded my tongue, Trol-la-laa. Ro'e mee gys y chibber, Hop-tu-naa. And drank my fill; Trol-la-laa. Er my raad thie, Hop-tu-naa. I met a witch cat; Trol-la-laa. And I ran away. Trol-la-laa. Cre'n raad ren oo roie Hop-tu-naa. I ran to Scotland. Trol-la-laa. Baking bannocks and roasting collops. Trol-la-laa.